Iodized salt is created by the simple act of adding a dry or liquid mix of potassium iodate or potassium iodide to salt (sodium chloride) with stabalizing additives. The source of iodide or iodate is obtained from only a few companies world wide. This include three Chilean companies mentioned on the Element Iodine page and one in India. According to the Salt Institute Organization, additives enhance the flow properties of salt to prevent clumping of the fine crystals. 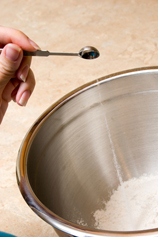 The Food and Drug Administration has approved YPS as an anti-caking agent. Tests determined that there is no evidence of toxicity at levels any higher than those levels used for highway deicing salts. It is interesting to note that Prussian Blue is used for household blueing, blueprints, blue-black ink, carpenter's chalk and is purported to be non-toxic to animal and plant life. The Salt Institute reported that several countries, including France, Mexico and Switzerland, also add fluoride, a known halogen, to table salt to prevent dental cavities. Unfortunately, there has been no valid proof provided to substantiate the claim that fluoride prevents cavities. 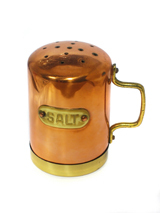 Salt is also being double-fortified with iodine and iron in several other countries. Your body requires salt (sodium chloride) to produce a chloride ion. This ion is essential for the production of hydrochloric acid in your stomach and is necessary to maintain the proper balance of sodium and potassium in the body. Iodized Salt in the U.S. In 1924, the U.S. started iodizing salt and had virtually eliminated the scourge of goiterism. However, in the 1980s,iodine was replaced with bromine in the bread-making process. Bromine is a goitrogen (promotes goiter in the body) and is a known halogen, which blocks the absorption of iodine in the body. Studies indicate there has been a decrease in the available iodine and an increase in bromine in food stuffs. It is interesting to note that this time line coincides with the report of increased thyroid cancer and mammary cancer. Unfortunately, there is a mistaken belief that using ordinary table salt, fortified with 77 micrograms of iodine per gram, is sufficient for your body's daily requirement. There are no studies written to substantiate this claim. Dr. David Brownstein, MD, author of Iodine: Why you need it, Why you can't live without it points out that refined table salt is a lifeless product with all minerals removed and toxic chemicals added to produce the white color. This makes it difficult for the body to absorb the iodine in this lifeless product. He suggests the use of unrefined sea salt since it has the additional trace minerals not found in regular table salt. Celtic salt is the most highly recommended natural product. 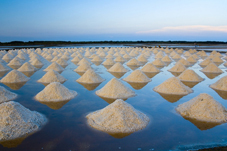 Sea salt includes potassium which holds water in your cells along with magnesium which helps to combat adrenal fatigue. 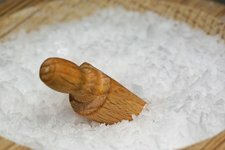 According to Janie A. Bowthorpe, M.Ed., author of Stop the Thyroid Madness: A Patient Revolution Against Decades of Inferior Treatment states that sea salt may be lacking sufficient iodine for your body. She recommends the addition of either kelp tablets, Iodoral (tablet form of Lugols) or liquid Lugols. The National Health and Nutrition Survey shows that iodine levels decreased by fifty percent in the United States when comparing the 1974 report to the 2000 report. The increase of pregnant women with low iodine increased 690% setting up an increased risk of mental retardation, attention deficit disorder, cretinism and health issues in the children. The Salt Institute estimates that 70% of United States consumption of salt is iodized. Because people are dining out more, not cooking home made meals, and are buying prepackaged products, the iodine consumption has declined from 250 micrograms per day to 157 micrograms per day. The population is now consuming products which are processed witn noniodized salt dictated by public health authorities. Instead of fortifying food products with iodine, bromine, a known disruptor for iodine absorption, is now being used. Iodine consumption has decreased in the United States, Canada, Australia, New Zealand and western Europe. Your choice of specific foods can naturally and easily increase the amount of available iodine for your body. Foods high in iodine would be a better alternative rather than using refined iodized salt.